AMD's hotly-awaited Mantle API is finally ready for a public unveiling, with new patches and drivers enabling the low-level API going live from today. To start with, anyone wanting to utilize Mantle in a supported game must install the new Catalyst 14.1 beta drivers, which should be available soon (within the next few days) from AMD's download center. Update #1 (Jan 31): At the last minute AMD identified an installation issue in the Catalyst 14.1 driver that renders it unsuitable for distribution. This delays the entire launch as we haven't been able to run any tests with the beta software yet and public release is also expected to be delayed by at least a few more days. As soon as we can get our hands on the proofed driver, we'll be reporting back with our own benchmarks. Update #2 (Feb 1): AMD has just gone live with the Catalyst 14.1 Beta drivers, allowing anyone to download, install and test out Mantle on their compatible systems. Click here to pick up the latest beta drivers now, as we continue to test Mantle performance on our test benches. Here are the direct download links: AMD Catalyst Driver 14.1 Beta for Desktop or Notebooks. Update #3 (Feb 1): We've been testing Mantle drivers with BF4 and after a very frustrating first 36 hours (we got them earlier than the public) we've decided not to pursue a formal test for now. In words of our senior hardware editor, Steve Walton: "BF4 has so many issues with Mantle it is making testing near impossible. StarSwarm seems to work okay though." From 4 AM EST, gamers will be able to download a Mantle-enabled patch for Battlefield 4 through EA's Origin service. At this stage, Battlefield 4 is the only full game that supports Mantle, although Oxide Games Mantle-enabled 'StarSwarm' demo will be available through Steam later in the day (3 PM EST) for gamers that want to further evaluate Mantle performance on their systems. Another Mantle-enabled title, Thief, will be released in February. In AMD's primer on Mantle, the company states that the API is "primarily designed to improve performance in scenarios where the CPU is the limiting factor". Mantle makes "less of an impact" in GPU-bound situations, although the API does have "some built-in features to improve GPU-bound performance [...] gains in these cases are largely dependent on how well Mantle features and optimizations are being utilized by the developer." Data provided from AMD's labs backs up what the company stated. For example, AMD claims that running Battlefield 4 (Ultra settings, 4xAA at 1080p) on an AMD A10-7700K APU plus Radeon R9 290X GPU gives a 41% performance boost when Mantle is enabled. On the other hand, if an Intel Core i7-4960X is used with an R9 290X, the performance boost is only 9.2% when Mantle is enabled. StarSwarm data shows an even bigger performance improvement when Mantle is enabled on CPU-limited systems: AMD claims a 319% performance boost when running the demo on Extreme settings at 1080p, on their A10-7700K system, after Mantle is enabled. However if you have a high-end Intel CPU and an R7 260X, performance gains are lower, at just 5.1%. There's a couple of other things to note here. 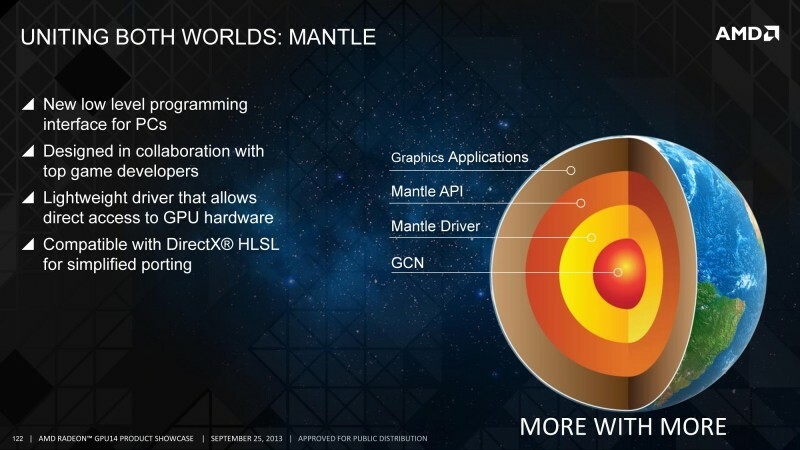 First of all, this is the initial release of Mantle, and AMD says the API will continue to evolve and improve in the months ahead. There's a strong possibility AMD and their game partners will be able to squeeze more out of the API as it improves. Secondly, Mantle, like a number of AMD launches recently, is geared towards giving a better PC gaming experience to those on lower-end hardware. As our resident hardware reviewer Steve notes, a performance kick for those with uber fast CPUs and GPUs isn't hugely important; whereas a 40+% performance boost on slower hardware could be the difference between a playable and unplayable game. We'll be posting a full performance breakdown of Mantle in Battlefield 4 and StarSwarm (pictured below) in the coming day or two, so check back soon for more detailed results from AMD's new API. Aside from Mantle, AMD's Catalyst 14.1 beta drivers introduce 'phase 2' frame-pacing solutions for resolutions higher than 1600p on non-XDMA hardware. This means gamers running dual-GPU HD 7000 series setups, for example, should see less tearing and stuttering when they're gaming on Eyefinity or Ultra HD displays. Catalyst 14.1 is also the first HSA-enabled GPU driver, allowing the CPU and GPU found in AMD's latest Kaveri APUs to simultaneously access the same memory. At this stage only some applications, such as Libre Office and Corel AfterShot Pro, are supported, but AMD assures us that many more will be supported soon.